Dr. Barbara Vanderhyden received the 2019 Trainee Mentoring Award from the Society for the Study of Reproduction for her profound impact on the next generation of reproductive biology researchers. She has mentored more than 120 students and postdoctoral fellows, many of whom have inspired new research directions. At a time when zero teaching assistant experience was offered to the graduate students who came to work with her, she developed formal ways to prepare and give them confidence. Her mentoring and outreach programs helped trainees build communications and teaching skills while motivating young people to explore the scientific world. She established and oversees the Ottawa chapter of the science outreach program Let’s Talk Science, which makes science fun for students in local schools. She also established Science Travels, which sends teams of grad students to deliver science workshops in remote First Nations and Inuit communities. Research at The Ottawa Hospital is possible because of generous donations to The Ottawa Hospital Foundation. 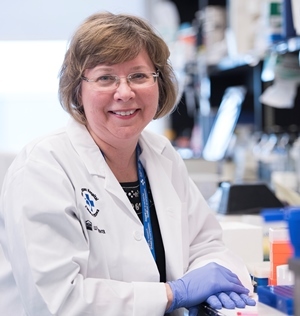 Quote: “I’m passionate about helping the next generation of scientists uncover their gifts and learn transferable skills that will help them in their careers.”- Dr. Barbara Vanderhyden, senior scientist at The Ottawa Hospital and distinguished professor at the University of Ottawa.